This is a light and fresh salad, ideal for keeping things simple after a busy day. A little chopping and not to much washing up, a little – but not totally – virtuous, this salad is satisfying and delicious. 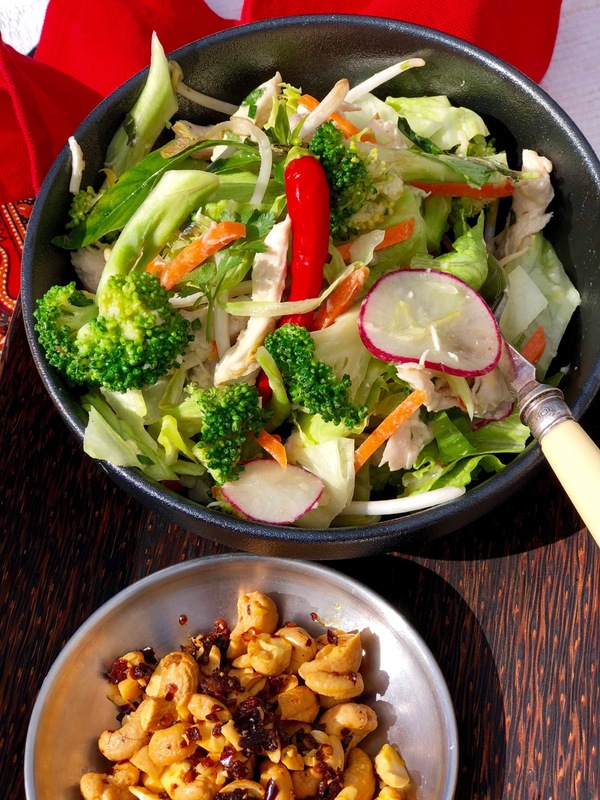 I have been making versions this salad for years and love the way these Asian flavours can be healthy, satisfying and a reliable crowd pleaser. Who wants to cook food that no one wants to eat! This is a salad that easily doubles or more for a crowd, or to have for leftovers for lunch or dinner the next day. These lively flavours lift a dull day and don’t leave you feeling weighed down or tired – limes, ginger lemon grass, chilli (a little or a lot), coriander (or not), vietnamese mint and or normal mint, kaffir lime leaves, fish sauce and or soy sauce, some crunchy peanuts, cashews or prawn chips and lots of fresh crunchy greens and vegetables of choice. 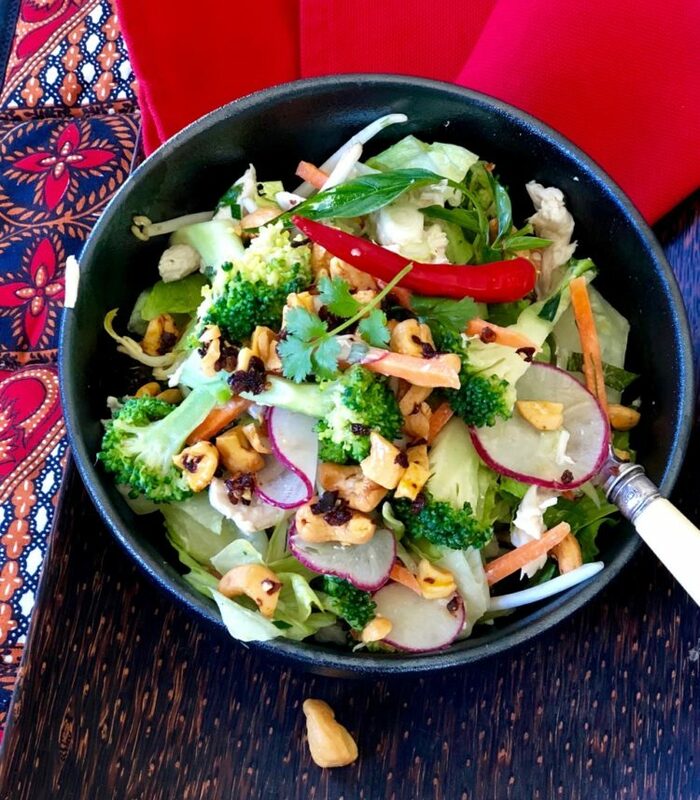 I have made this salad many times and have mixed the ingredients as many times – don’t be afraid – no kaffir lime use lemon grass or neither, want to make it vegan use soy sauce or tamari not fish sauce…The main thing to keep doing is tasting and aiming for a balance of sour, salty and spicy (to your taste). 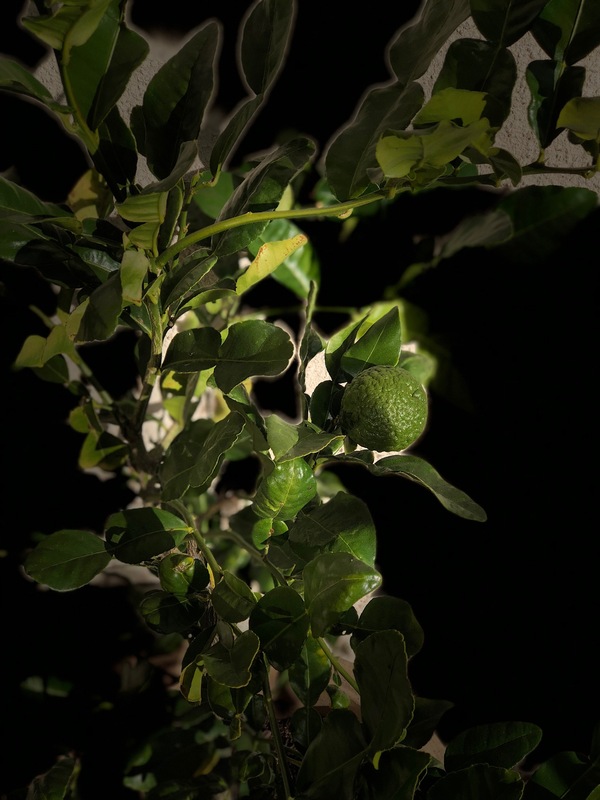 If you love these flavours I highly recommend you buy yourself a little Kaffir Lime Tree, I have one in a pot that I bring inside every winter it is only small but provides all the fresh leaves I could ever need, and it makes it much easier to achieve those exotic asian flavours any time. Kaffir lime trees don’t like the cold, I have mine in a tub that I bring inside for the winter, and I have only ever had a few of its limes, but the leaves give everything you want, and they aren’t seasonal which means you have leaves year round. Finally for the plant that keeps giving when it flowers the little flowers look and smell amazing. Place your chicken breasts and seasonings in a pot, cover with cold water and bring to a simmer. Allow the chicken to simmer gently for ten minutes and then put it aside in the pot until it is cool enough to handle. 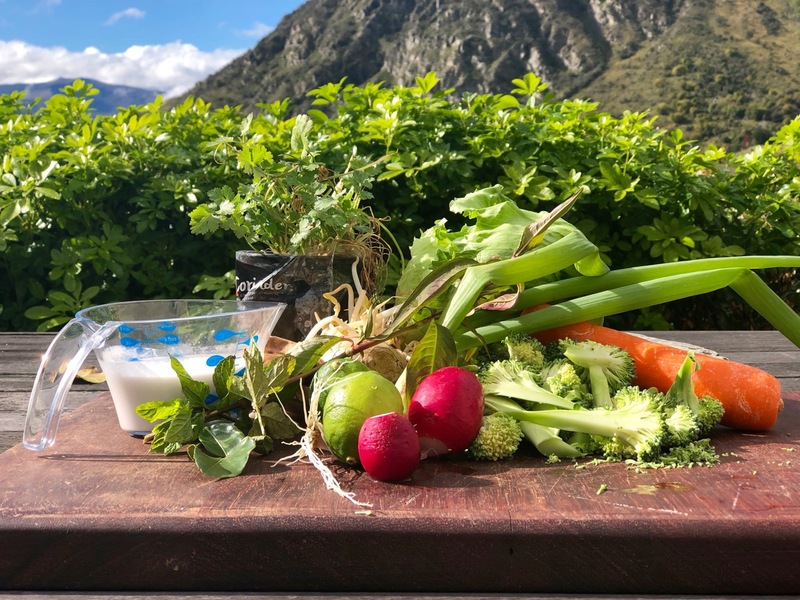 Using your hands, or two forks, pull the chicken into smallish bite size shreds ready to add to your salad dressing, or refrigerate until you make the salad. In the bottom of a bowl or roasting dish large enough to mix the whole salad, assemble all the ingredients and whisk together. Add your shredded chicken and toss well to combine. Top with your salad ingredients. At this stage (before you toss vegetables into the salad) you can refrigerate it, or toss the salad well and serve straight away. You can carefully plan this or use what you have to hand in your vegetable tray. Mung bean sprouts or other? Save some for garnish. 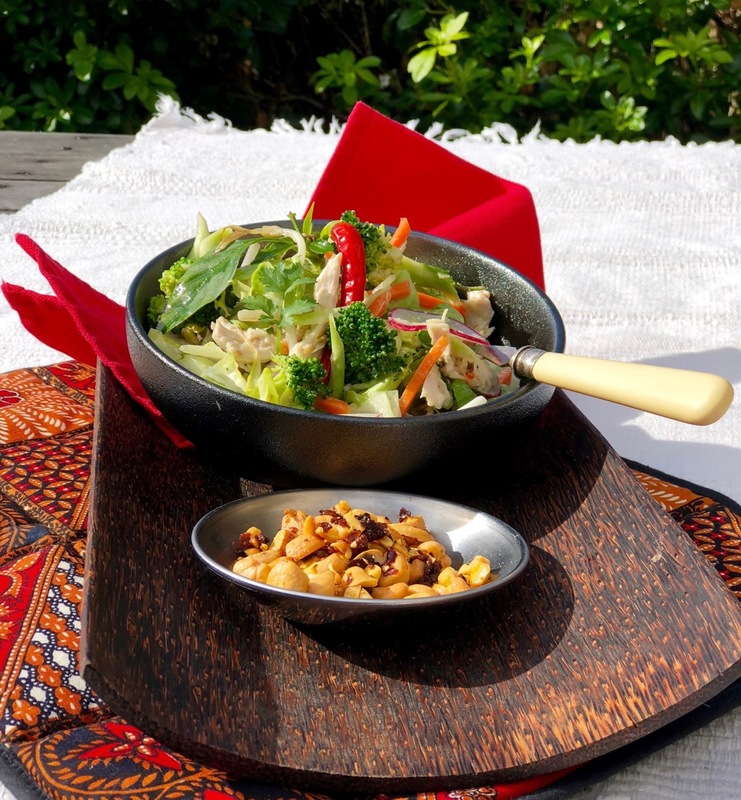 PEANUTS OR CASHEW NUTS – toasted or roasted with chilli oil and salt. Toss 3/4 through your salad and save the rest for a final garnish, along with some sprouts and red or green chilli slices.